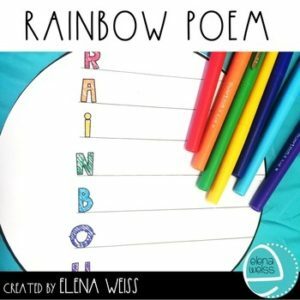 Use this round rainbow poem template to create a simple rainbow display. Simply cut out the round template and glue to a colorful plate (not included). Arrange all plates to form a class rainbow or display individually. With this freebie you get 2 templates. PLEASE SEE PHOTOS ABOVE SO YOU ARE CERTAIN OF WHAT YOU’RE GETTING WITH THIS FREEBIE! Your feedback is so important and greatly appreciated! Permission to copy for classroom use only. This product is to be used by a single teacher. Copying for more than one teacher, classroom, department, school or school system is prohibited. This product may not be displayed or distributed digitally for public view without written permission from the author.